N’Golo Kante’s new role for Chelsea this season has been the subject of much debate, with manager Maurizio Sarri tending to use him in a more attacking role than he’s played previously. 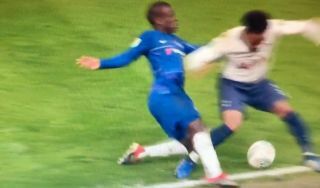 Still, the France international showed against Tottenham that he’s one of the toughest tacklers in the business, with this clip below doing the rounds on Reddit. Kante goes in hard on Tottenham left-back Danny Rose, leaving him screaming in pain – just what you want to see from the former Leicester City man!